There has been a lot of discussion in recent years about eating ten, rather than the usually recommend five, portions of fruit and vegetables a day. Recently, new research from Imperial College has shown that eating in this way could be really beneficial to our health. I am a chef, not a doctor or a nutritionist, but I do know what feels good for my body and what instinctively feels right to eat. For me that is focusing my plates around as many fruit and vegetables as possible. Although it might sound quite a feat, if you cook from scratch, including lots of fruit and veg in your day isn’t difficult and portions add up to ten quite quickly. 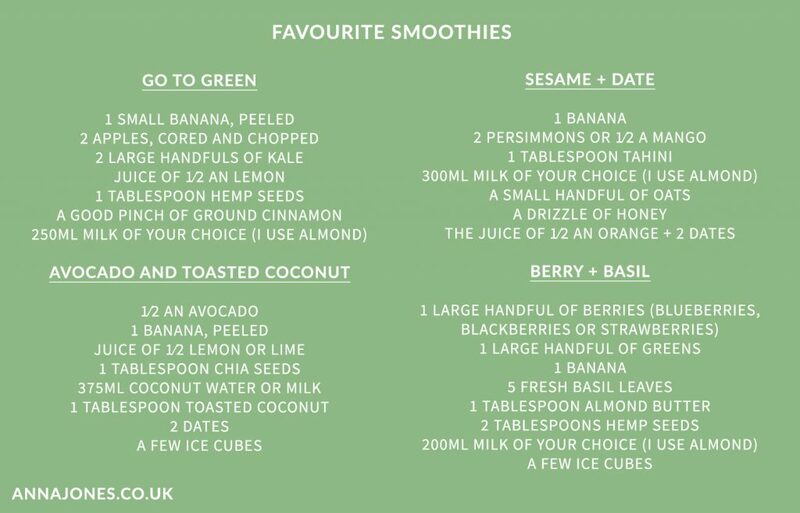 I’ve shared some versatile ideas below to take you from simple breakfast smoothies to deliciously quick puddings. These are easy ways to add more veg whether your goal is ten a day or just one more veg-centred meal. Smoothies are my favourite way of getting goodness into my body when time is short. If you are really bad in the mornings (like me), you can prep the jug of ingredients the night before and leave it in the fridge overnight. I’ve left quantities a little vague here, as you will want to tweak to your taste. You can make these smoothies a bit thicker and serve them in a bowl topped with fruit, or add-ons. I’ve come up with a page of a thousand soups as a good starting point if you ever lack a little inspiration. Start with a base layer, add herbs, spices, body, a back-up flavour and finish with a crunch of seeds or something more substantial. Serve with a slick of yoghurt or a drizzle of grassy olive oil, a fresh slice of sourdough or some smashed-up noodles, and you have the ultimate comfort food. 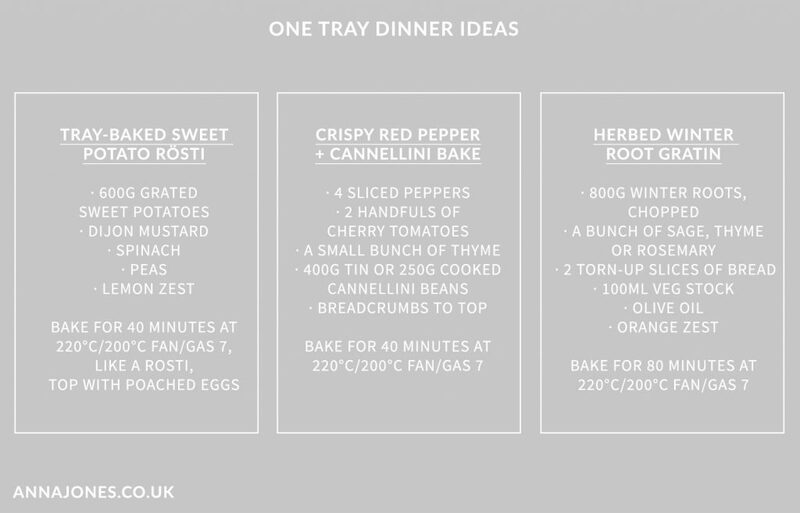 I love any dinner that’s made in one tray – less messing around, less washing-up and nothing to do while it all bakes. Here are some of my favourites, but you can freestyle as long as you mix a couple of veg, a bit of liquid (or a vegetable that will release some liquid), a herb and something hearty like beans or torn-up bread. Use a deep, approximately A4-size baking tray here. Each serves 4. I have a sweet tooth and I like to finish my meal with something delicious and a little sweet, but goodness- packed too. Sometimes it’s a snap of dark chocolate but other times it’s a quick fruit pudding. 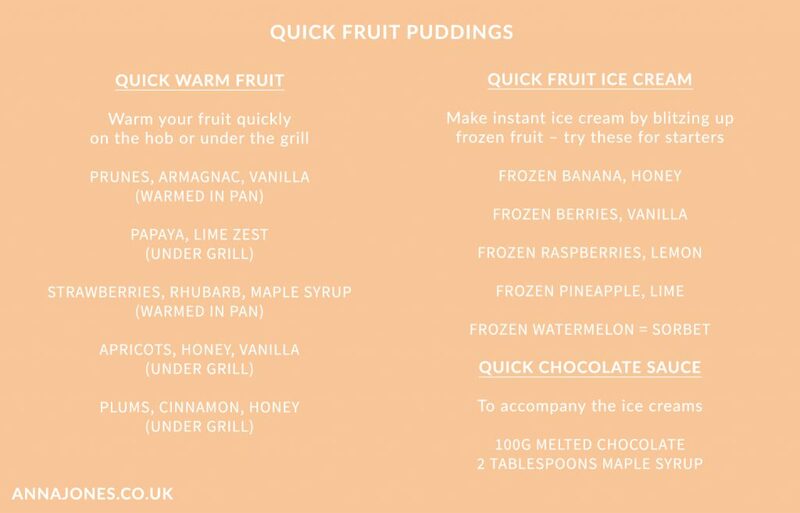 Here are some ideas for fruit puddings that are all ready in less than 10 minutes. 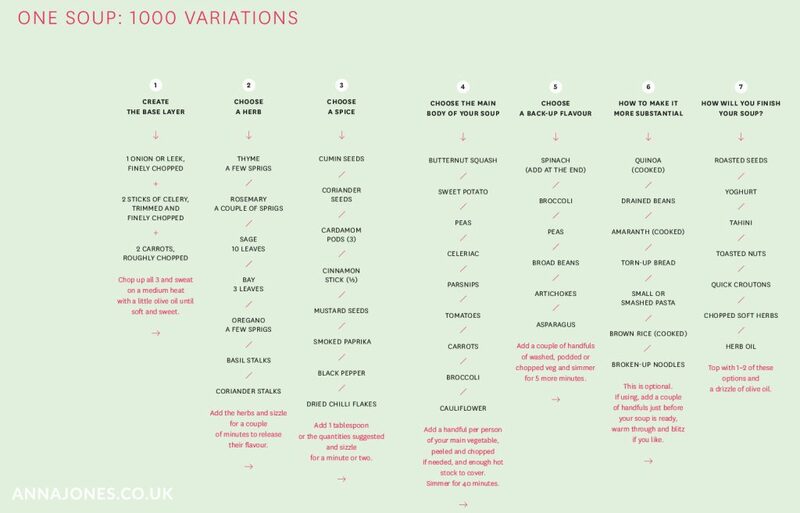 All of these food ‘maps’ are shortened versions of double page spreads that appear in my books, A Modern Way to Cook, and A Modern Way to Eat. Really love your posts and books. Will you be writing another one anytime soon? You definitely made the decision I made to become vegetarian an easy one with your excellent recipes. Thank you Anna for inspiring me and helping me grow as a cook. As a trained chef and food teacher, I have many cook books, but I have used yours time and time again to cook family meals, which my teenage children love. The recipes are accessible and workable and I feel that I have had my love for cooking reignited! I read your colum every Saturday in the Guardian also. Keep up the good work! This is wonderful! Thank you so much for posting! I love these roadmaps – I struggle often and each meal breakdown you did helps so much (especially the desserts too). Thank you! Have been introduced yesterday to your book by a friend.Will now be a regular.